Sister Moon and the Stars of Heaven, Give Praise to the Lord! What one of us in Consecrated Life (or in any other state of life for that matter) has not been moved by the inclusive spirituality of Francis and Clare in the wonderful hymn, All Creatures of Our God and King? The hymn is Franciscan through and through. 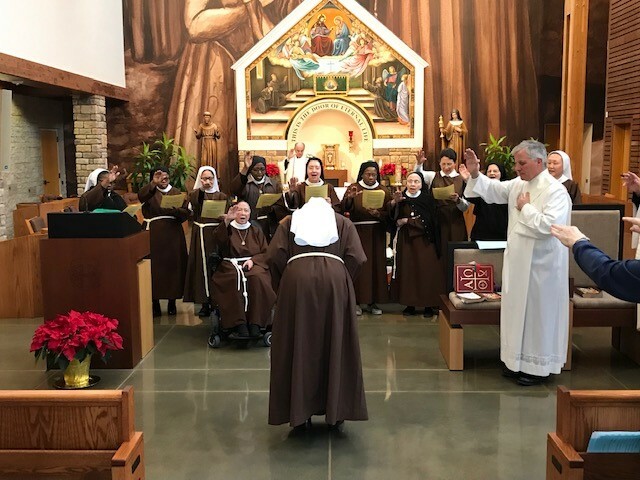 On Saturday, February 2, Presentation of the Lord, I was fortunate enough to preside at the Investiture Ceremony of one of the postulants going into the novitiate at the Poor Clares. Sister Christiana Maria Unyagh is a wonderful embodiment of Sister Moon and the Stars of Heaven, shinning with a glow of happiness as she was enrobed in her habit and accepted into the community of the Poor Clares. 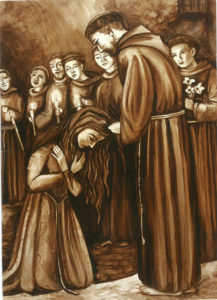 The huge mural of St. Francis tonsuring St. Clare’s hair in the background, told the story without using words. Because I have a lot of Franciscan in me, this ceremony was particularly moving. Some years ago, I had a blog on the abbey website and I dedicated one of those blogs to my Franciscan background. It is entitled: A Benedictine with Franciscan Roots. I think it can still be found on the internet. Also particularly moving is the setting of the Poor Clare monastery. It is on the extreme northern edge of our property. Many of us monks spent lots of time on the exact spot where the monastery is located. That spot was Campsite for our summer camp. Lots of memories come to mind at that very place. I can never go there and not be reminded of the simple beauty of nature and people throughout my life at that very spot. And of course, the place is even more sacred now that the Poor Clares are there. The setting, indeed, is Franciscan and it seems so appropriate in the history of St. Francis who was actually helped by the Benedictines. In many ways, the Poor Clares are an extension of who we are. Congratulations! Sr. Christiana Maria! May you grow and bloom as you work in your garden and pray and commune with all creatures as a Poor Clare. Blessings to you always. 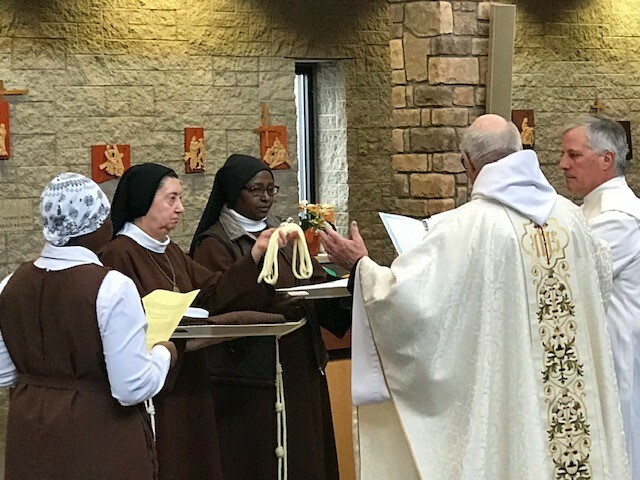 Blessing of Sr. Christiana Maria’s habit, veil and cord. 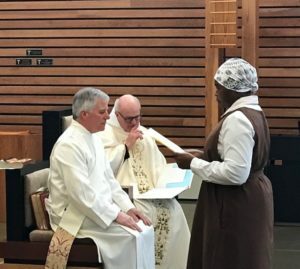 Poor Clare sisters bless their new novice.